Colorado Springs, my home town! Pikes Peak, my mountain friend! Every day of my childhood I woke to the chorus of western meadowlarks on the fence outside my bedroom, and the Peak majestically filling the window! Imagine the main picture window of your great room Magnificently framing Glorious Pikes Peak! AND colorado land for sale views! 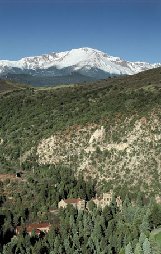 Imagine biking and hiking the Palmer Mesa Trail, following the historic route that General William Jarkson Palmer took from Colorado Springs to his Castle at Glen Eryie, adjacent to the Garden of the Gods! The Palmer Mesa Trail will lead you to the Foothills Trail and the Sinton Trail, taking you through some of the most wonderful parks and preserves in the area! Imagine living 5 minutes from Colorado College and the Fine Arts Center. Another 2 minutes and you are enjoying downtown Colorado Springs, filled with art galleries, excellent restaurants, outdoor cafes, book stores, and the world famous Uncle Wilber's Fountain. A mere 5 minutes, and you are in historic Old Colorado City, and another couple of minutes, Manitou Springs (nestled at the very foot of Pikes Peak)-- two of the unique districts for dining, shopping, and great art! And close by, the Cog Railway that will take you to the 14,110 foot summit of the Pikes Peak. Driving is an option, but the railway gives you time to enjoy each and every spectacular view without the worries of negotiating the narrow road! 3 exclusive lots are offered for sale on Mesa Road, the Roger & Olive Whitney subdivision. Each is well over an acre (1.84, 1.76, 2.37), each with spectacular views of Pikes Peak and the entire Colorado Springs front range. Imagine some of the best skiing in the world being within an hour or two from your own doorstep! There are many great golf courses around the city, each with a unique view of Pikes Peak! Drive a mere 2 miles north on Mesa Road to the world-class Kissing Camels Golf Club. Just 5 miles SW, and you find the Broadmoor Golf Club! The words are by Katharine Lee Bates, who taught English at Wellesley College, from where she graduated in 1880. In 1893, Bates rode the train to Colorado Springs to teach a summer school session at Colorado College. Several of the sights on that trip found their way into her poem. On The Peak, the words of the poem began to form in her mind, and she wrote them down in her room at the original Antlers Hotel (built by General Palmer in 1883). After graduating from Yale in 1928, and Harvard Medical School in 1932, Roger Sherman Whitney, MD, came to Colo. Spgs. in the mid 1930s to attend to Tuberculosis patients. Colorado Springs offered the perfect climate for their treatment and recovery--- wholesome food, pure fresh air, and exercise. The canvas ''tents'' allowed for one of the most important aspects, fresh cold air for the lungs, and the inspiring view of Pikes Peak to cheer the spirits! Just as WWII was starting, Roger met Olive Bradley, whose family had moved from Oklahoma to Colorado Springs when she was a child. 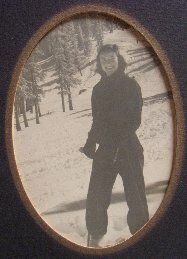 Olive had graduated from Colorado College in 1933, and was Homecoming Queen that year. She worked at the Fine Arts Center, and traveled to Mexico for the Taylor Museum. For more fascinating Roger Whitney history, Click Here!! 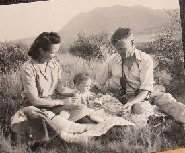 Upon returning to Colorado after the end of WWII, Roger and Olive were married, and in 1948 bought the lovely Mesa Road land with the spectacular views of their beloved mountains. Roger had been a mountain climber since his childhood, had climbed Pikes Peak a number of times--- and it was this passion that took his life in 1965 at the early age of 60. There is a perfect combination of the Four Seasons in Colorado Springs. Lovely Springtime, great Summers with historically great afternoon rain showers, the most glorious Autumn full of color, & crisp sunny days, and the Winters are often blanked with gorgeous snow....but rarely does it stay on the ground for weeks on end. And in each season, Pikes Peak has a special Glory, whether frosted with snow or revealing it's gorgeous barren rosy granite! Colorado has about 300 days each year that are sunny or mostly sunny. Humidity is quite low most of the year, thus preventing the ''muggy'' feeling. In a somewhat dry climate, the heat and the cold do not feel as intense! Colorado Springs never has hurricanes---of course, being so far from the ocean!! !---but also almost no tornadoes. I remember one, and possibly two, in my entire lifetime. Colorado Springs-- Great Climate to Green Build!! The US Green Build Council has some fabulous Green Home Building Design ideas and guidelines. Homes with LEED and Energy Star certifications. And a personal favorite, 15 terrific projects that can make a HUGE difference! We have several in our home that we installed over 20 years ago, and I love that we have greatly decreased our carbon footprint all that time!!!! When planning a home, consider Solar Hot Water, made by evacuated tubes, and Photovoltaic Electricity for part or all of you power needs. IT WORKS!! You can read about my Personal Off Grid Journey HERE--and I would be thrilled to answer any questions! If Figure Skating is your passion, or something you have dreamed of learning, Colorado Springs has some excellent skating facilities! Or is Hockey what you love? Indoor sports, outdoor sports--Colorado Springs has it all! 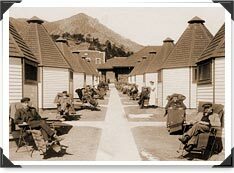 A favorite childhood memory is often visiting the Cheyenne Mountain Zoo! It was built in 1926 by Spencer Penrose, who was a philanthropist who built many of the landmarks in Colorado Springs. In 1938, he made the Zoo an incorporated, non profit, public Trust for the people of the Pikes Peak region. 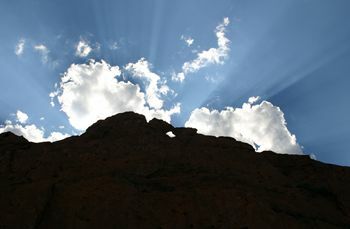 On the side of a steep mountain, what a spectacular view!! And the animals seem to love their unique home too; what they have done in the past couple of decades is AMAZING!!!! Right in the Zoo is a great Historic Carousel ready for anyone to ride!!!! And on up the hill, the Will Rogers Shrine Of The Sun. Spencer and Julie Penrose are buried there, but Spencer named it after his good friend Will Rogers, who died in a tragic plane crash. Talk about a view, WOW!!!! The Shrine stands 114 feet high, and was fashioned from a single slab of granite; it was finished in 1937. I will have to quote from the webpage for the foundation, because it was such a prominent presence all of my time in Colorado Springs; it is still benefiting the entire area!!! The El Pomar Foundation was established in 1937 by Spencer and Julie Penrose to ''enhance, encourage and promote the current and future well being of the people of Colorado through grantmaking and community stewardship.'' The Foundation's name "El Pomar" is old Spanish for "the orchard", derived from the Penrose home situated on an apple orchard. Based in Colorado Springs, El Pomar Foundation is one of the largest and oldest private foundations in the Rocky Mountain West, with assets totaling $500 million. El Pomar contributes more than $20 million annually through grants and community stewardship programs to support Colorado nonprofit organizations involved in health, human services, education, arts and humanities, and civic and community initiatives.